I have come to know Paul Yeager through our mutual experiences blogging about the weather. We share a fascination with the atmosphere around us and the sometimes explainable (but many times not) phenomena that come to make up the “weather.” Paul’s blog, CloudyandCool.com (which is on my blog roll), is an excellent resource and frequently contains interesting insight, but his most recent foray into publishing – Weather Whys: Facts, Myths, and Oddities (Perigee, $14.95) – is a must-read. Unlike many books on the topic though, it is not just a must-read for meteorologists, atmospheric scientists, and weather geeks in general. Paul notes that “weather is the most universal of topics” and I believe Weather Whys is one book that will appeal to folks across the spectrum – from the seasoned weather professional, to the weather enthusiast, to one with even a passing interest in the weather. His folksy story-telling tone, a broad knowledge in an array of atmospheric topics, and the ability to explain complex processes in a way that an average middle school student could understand, have come together in Weather Whys to produce a text that is not only information and educational, but entertaining from cover to cover. As the subtitle suggests, Weather Whys describes in detail where many of the myths and old wives tales originate, separates truth from fiction, and explains some of the idiosyncrasies that makes up the science – or perhaps it is the art – of meteorology. The best part of Paul’s writing style is his ability to relate to the general public, who has a basic understanding of weather obtained from their local TV weathercaster and any number of cable programs (and even an entire channel) devoted to the topic. If you are in the least bit interested in why it cannot be 100 degrees with 100% humidity, whether you should include snow skis in your checked luggage on your next trip to Hawaii, or whether there really is a “calm before the storm,” I highly encourage you to check out Weather Whys by Paul Yeager – and buy a copy for that middle school-age cousin who has begun showing an interest in the weather. Not only are you guaranteed to learn something new, you will probably chuckle in the process. 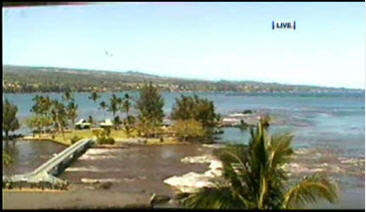 These photos are taken from live coverage at HawaiiNewsOnline.com during the tsunami of February 27, 2010. They clearly show the ebb and flow of the ocean over a period of several minutes. Look closely at the beach in the center-left of the imagery, as well as the turbulence in the water at the entrance to the small bay in lower center. You can also see changes in the rock outcroppings in the lower right. Time stamps are below each image. 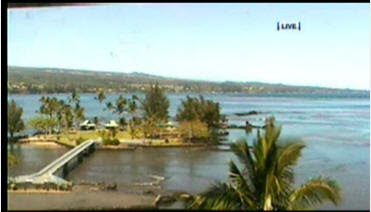 More information is available on Twitter by following #hitsunami and online at HawaiiNewsOnline.com. Be sure to stay abreast of Memphis, TN weather at MemphisWeather.net and MWN on Facebook and Twitter (memphisweather1). This is the last post (#7) in a series published for Severe Weather Awareness Week 2010. Today's post focuses on Skywarn... the NWS-trained storm spotter network. Severe weather can strike during any month of the year at any time of the day or night. When severe thunderstorms threaten... the National Weather Service calls Skywarn volunteers into action. 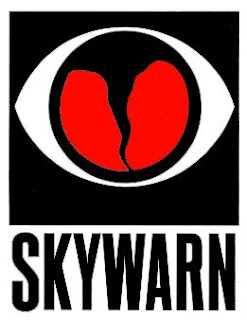 Skywarn volunteers are the eyes and ears of the National Weather Service... providing instant reports of severe weather including hail... high winds... and dangerous cloud formations. Who are these Skywarn volunteers? A large number of sky warn storm spotters in the Mid-South are amateur radio operators... or hams. These public-service minded individuals make ideal storm spotters... since they have the ability to communicate their reports. They are willing to be trained and they have a real interest in helping the National Weather Service and their local communities prepare for severe weather. Amateur radio operators are on call 24 hours a day... 365 days a year... even though they receive no compensation of any kind for their hard work. Many other groups participate in the Skywarn program... including law enforcement agencies... fire departments... utility companies... rescue squads... and the news media. In some areas... individual citizens are trained as spotters and are asked to relay their reports to the National Weather Service. Spotters are a vital link in the warning process and it is important to have as many trained spotters in each county as possible. MemphisWeather.net provides the latest severe weather information, including flood and flash flood warnings, for the Memphis metropolitan area. This includes all watches and warnings, an interactive severe weather map of the Mid-South, and free delivery of severe weather alerts for the metro area via e-mail and Twitter. Find these services under the "Severe Weather" menu on MemphisWeather.net. We hope you have enjoyed reading this week's series of posts for Severe Weather Awareness Week. 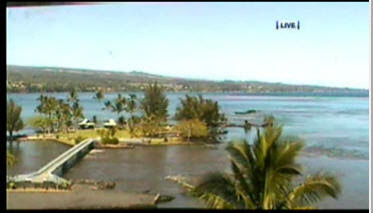 Most of this post's content courtesy of the National Weather Service. This is post #6 in a series published for Severe Weather Awareness Week 2010. Today's post focuses on NOAA Weather Radio and the Emergency Alert System. up-to-date weather information directly from the National Weather Service. You need a special radio to receive weather radio broadcasts... a radio that is capable of receiving signals in the very high frequency public service band. In Memphis, the National Weather Service broadcasts on a frequency of 162.475 MHz. Broadcasts may vary but generally include area forecasts... present weather conditions... short-term forecasts... climatic data... river and lake stage forecasts... and other specialized information. 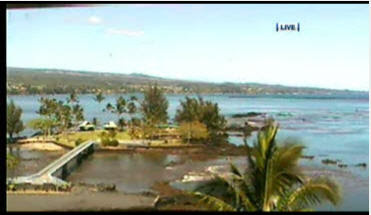 The broadcasts are updated continuously. Weather radio is useful anytime... but it is most important when severe weather threatens. During periods of severe weather routine programming is interrupted and the focus shifted to the local severe weather threat. In an emergency... a warning alarm tone is broadcast that activates specially designed receivers to turn on automatically... or to produce a visual or audible alarm. 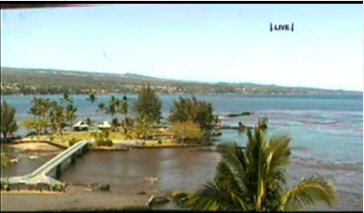 A primary source of weather information is the emergency alert system. EAS is a system of communications links that utilize data in a digital form. It is a reliable means of linking the National Weather Service... emergency management agencies... and the radio and television broadcast media together. EAS helps participating radio and television stations receive and relay weather warnings and other emergency information in a timely manner. 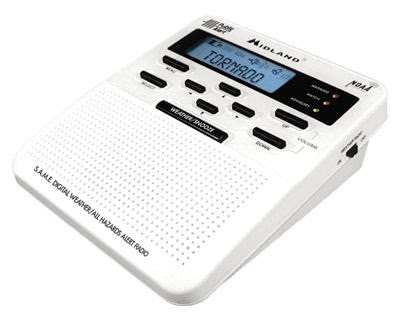 Did you know that you can get a FREE Midland WR-100 NOAA Weather Radio like the one pictured above? MemphisWeather.net is running two advertising specials this month that will net you a free radio, already programmed to alert for your county! Rates are very competitive and our audience is regional. Click the link above for more information on how to get a free radio. MemphisWeather.net provides the latest severe weather information, including flood and flash flood warnings, for the Memphis metropolitan area. This includes all watches and warnings, an interactive severe weather map of the Mid-South, and free delivery of severe weather alerts for the metro area via e-mail and Twitter. Find these services under the "Severe" menu on MemphisWeather.net. This is post #5 in a series published for Severe Weather Awareness Week 2010. Today's post focuses on the dangers of flooding and flash flooding. 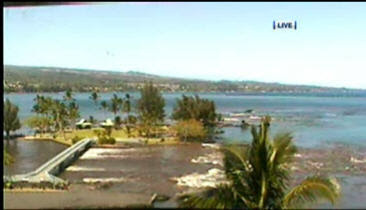 Severe weather awareness week continues today with a look at flood and flash flood safety. Flooding and flash flooding are... perhaps surprisingly to some... the #1 weather-related cause of death in the United States. Floods and flash floods occur every year in the Mid-South. 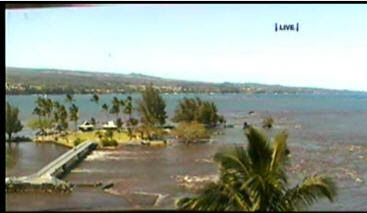 River flooding occurs seasonally when winter or spring rains or torrential rains associated with tropical storms fill river basins with too much water too quickly. 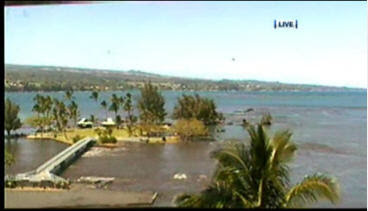 Flash floods occur suddenly... usually occurring within hours of excessive localized rainfall. These flash floods can become raging torrents which rip through river beds... urban streets... or valleys... sweeping everything before them. Avoid already flooded and high velocity flow areas. Do not attempt to cross a flowing stream on foot where water is above your ankles. Do not allow children to play in or near ditches... gulleys... or culverts following a heavy rain event. Though children are adventurous and may find the fast-flowing water intriguing... lives can be lost if they lose their footing or attempt to cross the flowing water. 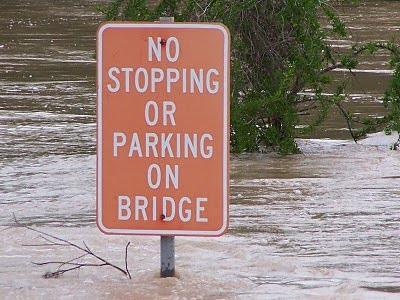 If driving... know the depth of water in a dip before crossing. The road bed may not be intact under the water. Don't drive into a pool of water or where water is flowing. Water up to the bumper will likely stall a car and can pick it up and move it. If the vehicle stalls... abandon it immediately and seek higher ground. Rapidly rising water may engulf the vehicle and its occupants and sweep them away. Turn Around - Don't Drown. 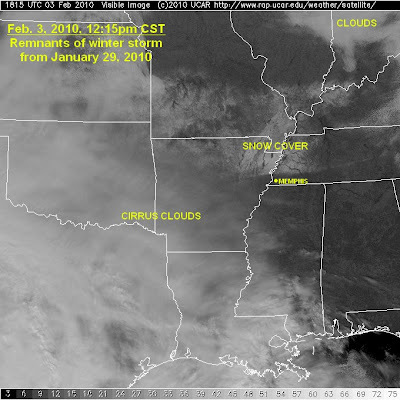 This is post #4 in a series published for Severe Weather Awareness Week 2010. Today's post focuses on tornadoes. 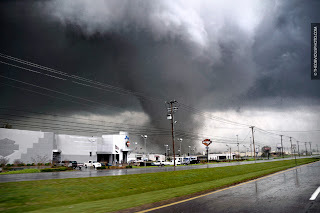 In 2009, 39 Tennessee counties were affected by tornadoes, with two fatalities and 62 injuries reported. Total damage estimates for the year exceeded $100 million. Most residents of the Mid-South will remember the July 30th storms that dropped two tornadoes in the metro area, including an EF-1 that struck Cordova near Wolfchase Galleria and an EF-2 that hit parts of Olive Branch. Remember...a Tornado Watch means that tornado development is possible... so watch the sky for developing thunderstorms and all the hazards they bring. Stay tuned to weather radio... commercial radio or television for weather statements or warnings. A Tornado Warning...usually issued for 1 or 2 counties at a time... means that a tornado has been sighted or indicated by weather radar. Persons in the path of the storm need to immediately find shelter... preferably in a sturdy building (below ground if possible). In homes or small buildings... go to the basement or storm shelter or to an interior room such as a closet or bathroom on the lowest level. Get under something sturdy... such as a heavy table or a bed. In all cases... stay away from windows. This morning... between 9am and 9:30am... a regional Tornado Drill will be conducted. NOAA Weather Radio tones will sound and the Emergency Alert System will be activated. Many schools... businesses... and other venues with tornado preparedness plans will exercise those plans. Now is a good time to review your personal preparedness plan. Where will you go and what will you do should a tornado threaten you while at work... school... or home? MemphisWeather.net provides the latest severe weather information for the Memphis metropolitan area. This includes all watches and warnings, an interactive severe weather map of the Mid-South, and free delivery of severe weather alerts for the metro area via e-mail and Twitter. Find these services under the "Severe" menu on MemphisWeather.net. This is post #3 in a series published for Severe Weather Awareness Week 2010. Today's post focuses on the hazards of lightning. On Wednesday... we will conduct a tornado drill between 9 and 10 A.M. in Tennessee... Arkansas... and Mississippi. This is post #2 in a series published for Severe Weather Awareness Week 2010. Today's post focuses on severe thunderstorms. There are approximately two thousand thunderstorms in progress around the world at any given time. Most of these storms are beneficial and bring needed rain. Only a small fraction... less than one percent... are classified as severe. Severe thunderstorms are those thunderstorms that produce hail one inch in diameter or larger and or strong wind gusts of 58 mph or greater. Hail that is one inch in diameter is about the size of a quarter. Remember...a Severe Thunderstorm Warning means that a severe thunderstorm is occurring. The severe thunderstorm has been detected by the Doppler radar or reported to the National Weather Service by our Skywarn spotter network or the local law enforcement agency in a particular county. A Severe Thunderstorm Watch means that conditions are right for severe thunderstorms to develop... but none has been observed. Folks should keep an eye on the sky and listen to commercial broadcasts... weather radio... or check MemphisWeather.net for any subsequent warnings. When a Severe Thunderstorm Warning is issued for your location treat it the same as you would a Tornado Warning. Severe thunderstorms can produce damaging winds large hail and deadly lightning. 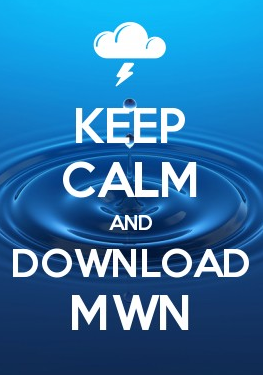 Welcome to the MWN Blog's post #501! My 500th blog post, sent earlier today and one week shy of the two year anniversary of the start of this blog, discussed the fact that this is severe weather awareness week in the Mid-South. I encourage you to read it, as well as the series of posts coming this week on various topics related to severe weather. Now is the time to make sure you are prepared for any severe weather we may get this season, which runs from mid-March through early May in this region of the country. As I type this, showers and embedded thunderstorms are rumbling through the region. I stepped outside a bit ago and smelled the distinctive aroma of a spring rain shower as I listened to thunder rumble in the distance. After a seemingly long winter, these are welcome signs that spring is not too far away! Unfortunately, we will have to deal with a little more winter cold this week in the wake of this evening's cold front, and another that will come through Tuesday night. While today's front brings in an airmass of Pacific origin and not a lot of cold air (but noticeable still the same), Tuesday's front marks the leading edge of an Arctic airmass that will thankfully just provide the Mid-South with a glancing blow, while the brunt of the cold air remains over the Ohio Valley. The MWN forecast shows as much, with highs dropping back nearly 20 degrees from today's mid 60s readings for Monday and even cooler air expected for mid-week. Lows will be back below freezing by Wednesday morning. Fortunately, there doesn't appear to be any precipitation in the forecast after tonight for the rest of the week, though subtle upper-level systems will bear watching. Sunshine should re-appear in force by Wednesday. This is post #1 in a series published for Severe Weather Awareness Week 2010. Today's post provides an overview of the week's activities. MONDAY...FEBRUARY 22ND THROUGH FRIDAY FEBRUARY 26TH. WEDNESDAY IS TORNADO AWARENESS AND WILL SERVE AS TORNADO DRILL DAY. The cold weather pattern of the past few weeks has broken for just a few days as the Mid-South saw their first 50 degree day today since January 28. A full day of sun was a welcome sight, and so was the lack of snow cover! 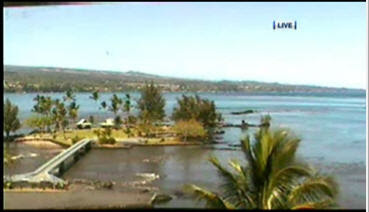 Today was the first day without any snow on the ground at WXLIVE! in Bartlett since the February 8th storm, and only the 5th day this month. Though it was still below normal temperature-wise, that streak (which is also at 21 days) should end tomorrow as highs climb to the mid to upper 50s. It's been an unusually cold and active winter for the region (see Eddie Holmes' blog on the topic as it relates to Jackson, TN), so a few nice days in the mix is welcome. Following a low pressure system that will bring rain to the area this weekend, another round of Arctic air will spill into the tri-state region next week, which could hold tight through the early part of March (8-14 day outlook), as we end meteorogical winter. Though the U.S. has been well below normal this winter, Jeff Masters at Weather Underground reports that last month was the warmest January in the lower atmosphere since 1978, globally speaking, continuing a trend of above normal temperatures since the current El Nino began last summer. The measurements are taken from Microwave Sounding Unit aboard a polar-orbiting satellite. One final note... I'll be speaking tomorrow to the second graders at Rivercrest Elementary School for their Career Day. I hope they enjoy my talk on being a world famous pastry chef! Ha! I always look forward to opportunities like this and am especially grateful to the staff at Rivercrest for having me tomorrow. I think my second-grade daughter is more excited than I though! The Winter Storm Watch that was issued Saturday afternoon for all of west TN and north MS has been upgraded to a Winter Weather Advisory. The Advisory goes into effect at 6pm Sunday and continues through 6am Monday. It includes Memphis and Shelby County, Tipton County, Fayette County, and DeSoto County. Expect light rain on Sunday to change to snow by evening as very cold air moves in behind an Arctic cold front. Accumulations of an inch or so are expected in the metro area, with up to 2" to the east of the city, mainly overnight Sunday night. Light snow or flurries could continue into Monday morning and driving conditions could be hazardous for the lighter-than-normal President's Day commute Monday morning as temperatures bottom out in the upper 20s. 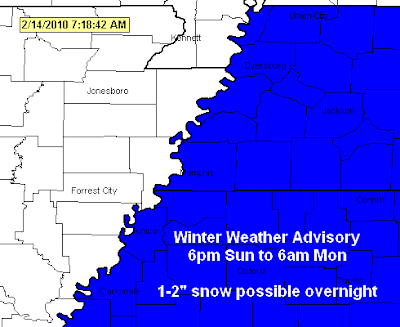 In addition to this Advisory, there is also a Winter Weather Advisory in effect for northern parts of west TN (not including the metro area) overnight tonight, as up to 1-2" of snow and sleet are expected overnight before becoming light rain Sunday. INCLUDE THE MEMPHIS METROPOLITAN AREA. MODERATE SNOW ACCUMULATIONS TO MUCH OF THE MID-SOUTH SUNDAY NIGHT. What a cold and snowy winter it has been so far across the region! With two winter storm events in January and one so far in February (not counting the one that is going by to our south today), no one would argue that it has been an active pattern. El Nino has at least something to do with that, as we have had several southern stream storm systems (say that three time fast)like today's which move across the southern U.S., tapping the Gulf of Mexico as their moisture source. While we narrowly missed out on today's storm, we have yet another chance in the short-range forecast as a clipper system takes a nose-dive out of the Northern Plains into the Mid-South on Sunday. It will bring with it a couple of rounds of precipitation - scattered light showers ahead of the Arctic cold front, an upper-level low that will be trailing the main surface low, and then another impulse in the resulting northwest upper level flow on President's Day. As of now, it appears we might be warm enough to start out as rain early Sunday morning ahead of the cold front, though a little snow could be mixed in to the north where surface temps may support it. The cold front then comes through during the morning and cold air begins to move in by afternoon, accompanied by the first upper-level low. That round of precipitation could change over to snow during the afternoon hours, continuing into the evening, as much colder air pours over the region. Then on Monday, in the Arctic air behind the system, mostly cloudy skies and cold air filtering into the region could be enough to produce some flurries during the day. A far as totals, it's too early to say for sure, but there is the possibility of about an inch or so from late afternoon into the evening on Sunday. I don't expect any snow that falls early in the day or on Monday to amount to anything. This winter system will be enough to continue our streak of below normal temperatures. High temperatures at Memphis International have been below average every day since January 28, and that appears as though it will continue through the extended forecast, pushing us towards 3 straight weeks below normal. I guess maybe the groundhog was right this year? I for one am looking forward to spring! With each forecast over the past 24 hours, the possibility of accumulating snowfall has increased. 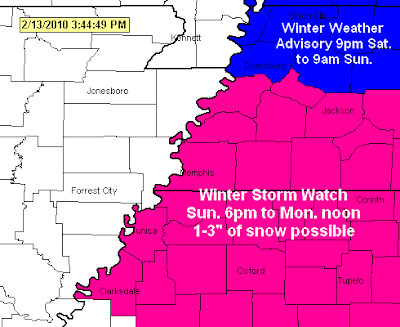 Once it began falling over northeast AR and critical low-level surface temps were better analyzed, the NWS upgraded a Winter Weather Advisory to a Winter Storm Warning early this morning, which will continue until 4pm. The snow began around 3:30-4:00am in the city and has piled up quickly along the TN/MS state line since then, with most places blanketed by 1"+ as of 6:30am. The airport area, southern Germantown, Collierville, Olive Branch, and Southaven are already at 2-4"! As for the rest of the day, it looks like snow will continue through mid-afternoon before transitioning to rain. Some sleet could mix in during the transition this afternoon. Snowfall rates could continue near 1"/hr. at times, with some heavier bands producing more. Thus, the predicted totals of 4-8"+ are well within reason. The rain late this afternoon and evening should help the traffic situations somewhat, but rain will transition back to light snow after midnight as temps drop back into the upper 20s, possibly making Tuesday morning's commute a tricky one. The toughest remaining part of this forecast is when exactly the rain changeover will take place. If it is delayed, look for snow totals to increase further. As for the rest of the week, another storm system will move in Thursday night and Friday. Once again, the atmosphere will be cold enough to support snow, so this one will also bear watching. Enjoy your snow day kids! 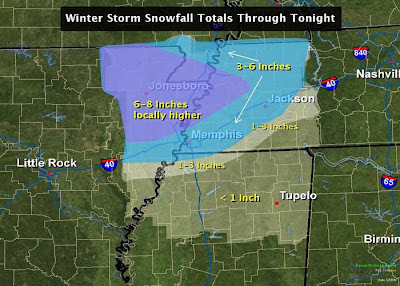 Stay with MemphisWeather.net and the MWN Blog for the latest details on today's winter weather. Today marks the two-year anniversary of the infamous "Super Tuesday Tornado Outbreak" that swept through the Mid-South on Presidential Primary Day, Tuesday, February 5, 2008. On that day, 57 people lost their lives in 4 states and roughly $500 MILLION dollars in damage was done by 87 tornadoes. This outbreak was the deadliest in the era of the modern NEXRAD Doppler Radar (since 1997). In this region, you will remember the EF-2 that killed 3 people as it was caught live on WREG-TV's cam in east Memphis as it moved through Southaven and into Hickory Hill. And who can forget the EF-4 that decimated the dorms at Union University, yet amazingly spared every life. This outbreak serves as a reminder that severe weather can happen at any time and does not have to occur in the "traditional" severe weather seasons of spring and late fall. I encourage you to check out the references below for more on this storm system. Hurricane Whodat is predicted to make landfall on the South Florida coast in the vicinity of Miami on 7 Feb 2010 at approximately 2200Z (5:00 PM EST). This extremely powerful hurricane is expected to produce damaging Shockey waves and Category 5 Brees. Reports from shipping indicate that this unstoppable storm has blown a huge flock of Cardinals all the way to Arizona , and that it has sunk a replica Viking longboat, the Brettigfǻvren. Livestock, in particular young horses, will be in severe danger of being decimated. Predictive damage estimates are unavailable at this time, but they are expected to be significant. All interests in and near the Miami area are advised to prepare for a storm surge of catastrophic proportions as Hurricane Whodat begins to arrive in full force on Sunday February 7th.. Remember it's still winter! Just because we've had two storms that have caused schools to close doesn't mean there won't be more! Any additional inclement weather days will be made up either that week of May 24, or as the school boards designate.